Seasons Greetings! 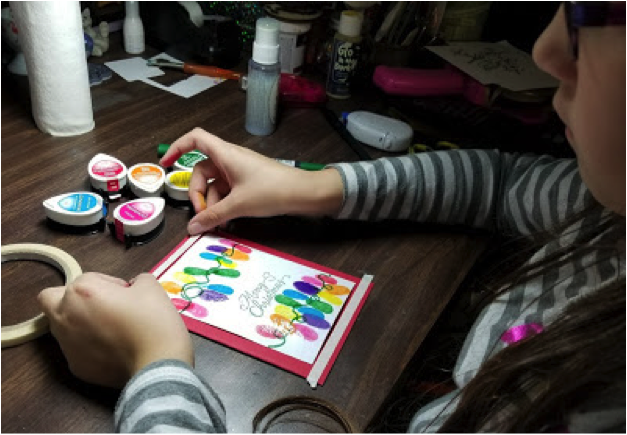 This month, the Imagine Artists in Residence are sharing Kids Craft projects to do over the upcoming Thanksgiving break. This is totally up my alley because my children and I make crafts together all the time. So my daughter and I put on our thinking caps and came up with this sweet Christmas Lights card. She and I are going to walk you through the whole process, which actually is pretty easy! I cut a piece of white cardstock down to 5 1/4″ x 3 3/4″. My daughter (Miss R) created the “string” for the lights with a Cottage Ivy Memento Marker. She drew just one across the top. And you can see her chosen colors for the “lights” in the photo. 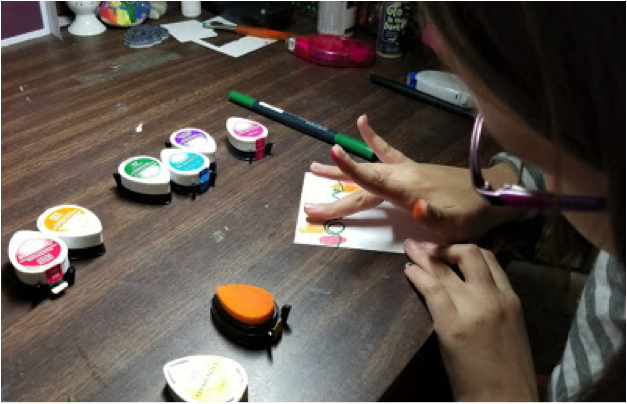 Using her index finger, Miss R first dipped into Lady Bug Memento Ink and stamped it a couple of times on the light string. Next, she used a different finger in Dandelion Memento Ink. We made sure to flip the cardstock over so that her lights were going in several directions. She then used Tangelo, Cottage Ivy, Bahama Blue, Grape Jelly, and Rose Bud ink. By now, her fingers were nice and inky! We decided to stamp a sentiment in the center of the card and have another light strand below it. 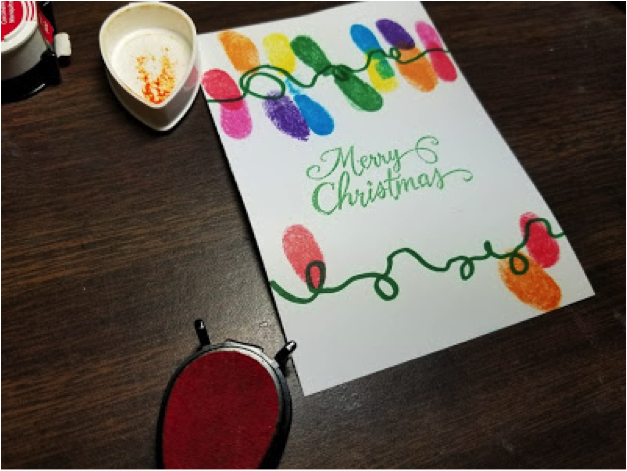 We chose a script “Merry Christmas” and inked it up with Cottage Ivy ink, and heat embossed it with Clear Embossing Powder. 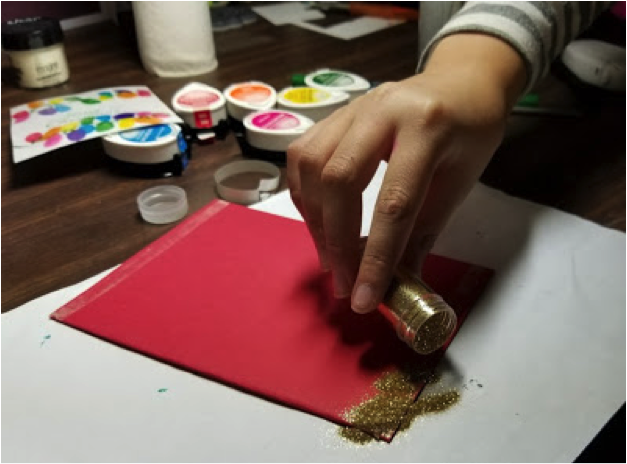 If you are doing this project with very young children, all of the embossing steps should be done by a grown up. 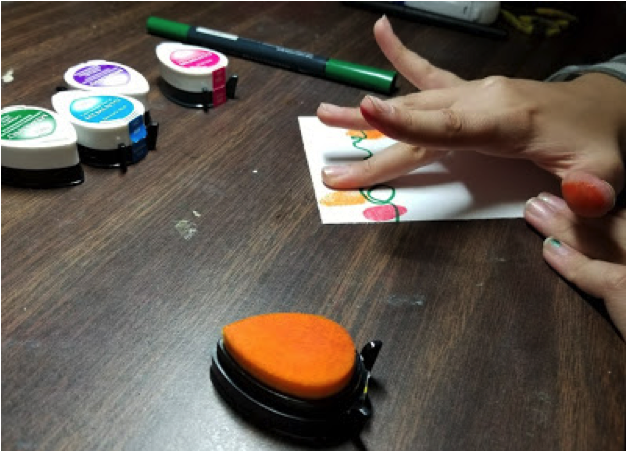 My daughter is almost 9, so I let her use my heat tool. After the sentiment was done, she drew her second string and began applying the fingerprint lights again. You can easily just stop with that step and mount the piece on to a card base and be done, but Miss R and I always like to take things to the next level. We thought the lights needed some shine. So I opened up my bottle of GooseBumps (proceeded to spill it all over my desk), and Miss R painted on some shine to each and every light. We decided it was best to dab on the GooseBumps, rather than brush it on. It added the extra dimension. You can see the shine on the Tangelo and Rose Bud lights on the bottom strand really well here. We chose to use a red card base, but she wanted more….sparkle! And I couldn’t deny her glitter. 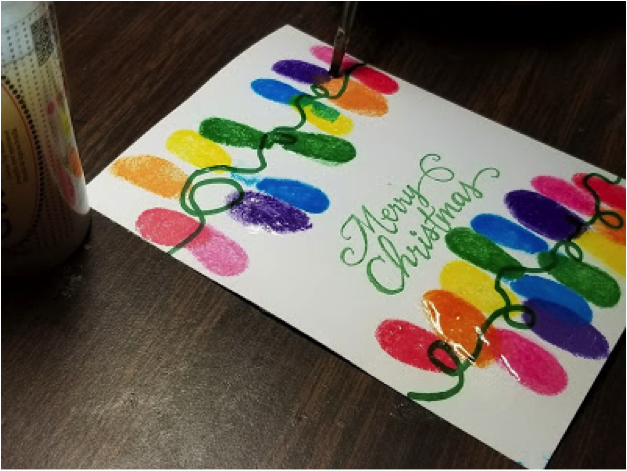 Using Tear It Tape, she applied a line of it at the top and bottom of the card. Please note, the inked layer is not yet adhered to the card base. It’s just placed on the card for reference. We didn’t want to take a chance that the GooseBumps weren’t fully dried and would then get covered in glitter. Miss R chose a gold micro glitter, and I thought it was the perfect color. She sprinkled it on, patted it down a bit and tapped off the excess. After repeating this on the other side, we adhered the inked layer to the card base and voila! Card complete! Here you can see the pretty sheen that the GooseBumps gave to the lights. 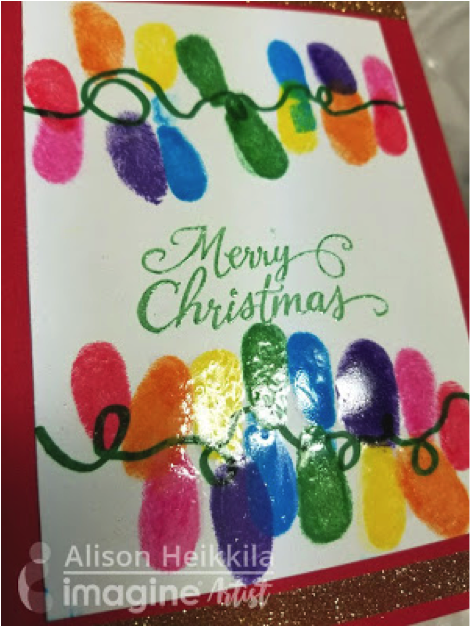 You do not need to use so many colors if you want to make this card with your child. 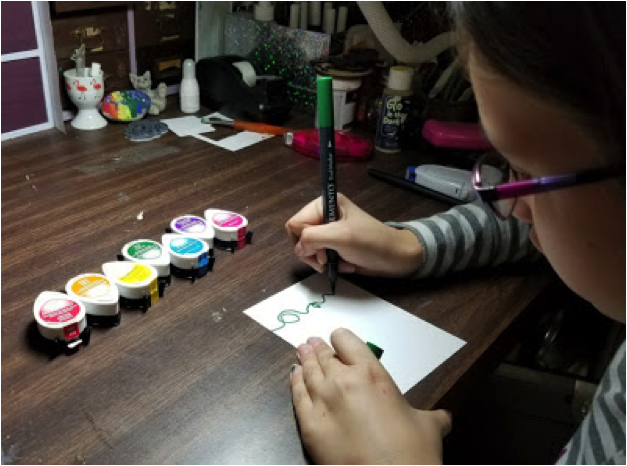 My daughter just couldn’t leave any of the colors of the rainbow out. We think this turned out great! 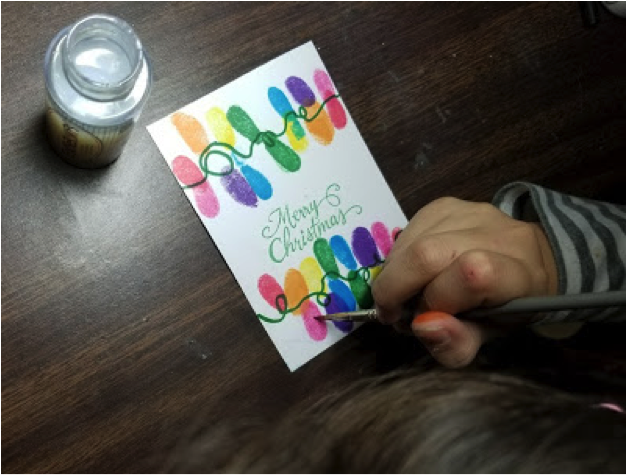 I know our family would love getting a card like this from Miss R. And she did a great job coming up with the idea for the project with me. Thank you so much for stopping by if you like what you see then please share or comment below. Have an inspiring day! *Memento is a water-based acid free dye ink that has not been tested for use by children. Memento Ink may temporarily stain skin. 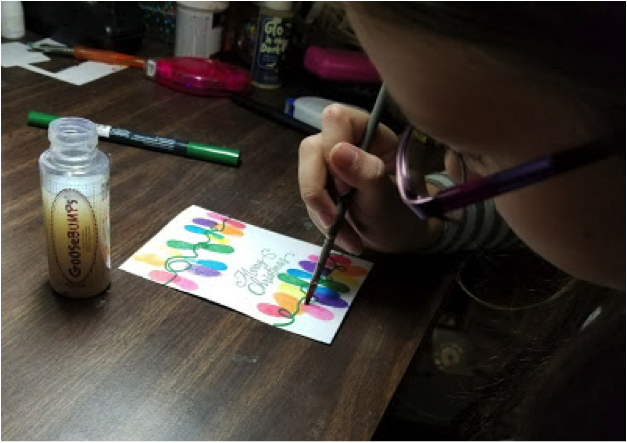 This entry was posted in Alison Heikkila, Beginner, Cards, DIFFICULTY LEVEL, DIY, Holiday, INSPIRATION, PROJECTS and tagged cardmaking, DIY Inspiration, Embossing, Embossing Powder, Memento, tear it tape. Bookmark the permalink. This is so fun for kiddos !